Concept design for Yarra Pools by Studio Octopi. Courtesy Yarra Pools and Picture Plane. Swimming, floating, playing in the Yarra River (Birrarung)? Nope, we’re not joking—currently in Melbourne, a number of community-led projects are working hard to activate the Yarra’s inner-city reaches. Though each of the projects are different, they all have one aim in common: to restore the river so it can be used for on- and in-water activities that can a) benefit health and wellbeing, b) drive investment to green infrastructure, and c) attract more people to our beautiful, vibrant city. These projects, along with recent Victorian Government initiatives to improve protection of the Yarra (Birrarung), present a special opportunity to think about what’s next for the river. 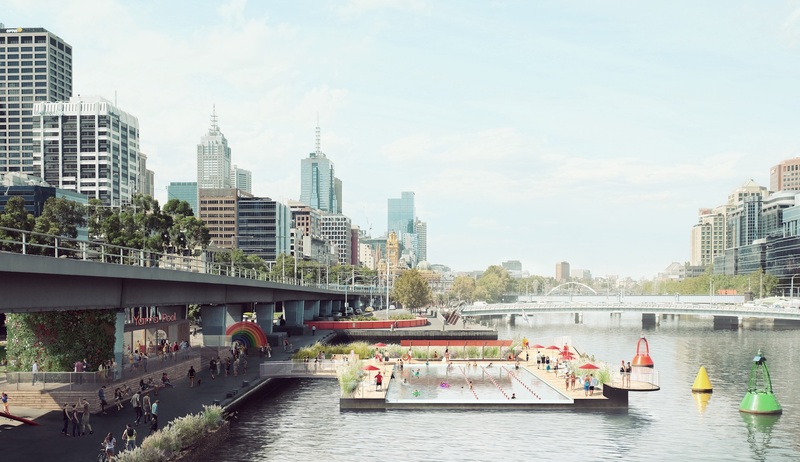 Led by YarraPools—the team behind the proposal to construct a permanent swimming pool in the Yarra in Melbourne’s CBD—in conjunction with the Inflatable Regatta, the Yarra River Keeper, CoCreate Cremorne and the North Wharf wetlands proposal, this workshop and discussion will explore community views of the Yarra. Each organisation will have six minutes to pitch their concept or idea for Yarra River improvement, which will then be followed by a panel discussion around how to get community-led projects happening. Come down to workshop new and existing concepts, and to have your say in how we might reframe the possibilities of our precious waterways.